The information on stones that is provided on this site is for recreational and personal reference purposes only. It is not intended to be a substitute for professional care. If you have a medical or psychiatric condition please consult your doctor - getting professional help is very important, even if you just need to talk to someone. 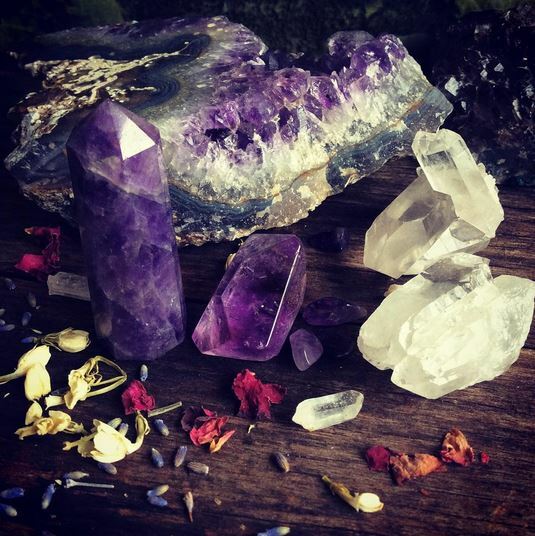 The information provided in listing descriptions, and in gemstone and crystal descriptions is not presented as a substitute, nor intended to be a substitute for medical advice, treatment or diagnosis. Never disregard advice from your medical professional or delay seeking medical advice. Again, Always seek the advice of your medical physician, or other medical professional or qualified health care provider with any questions that you might have about any medical condition. There are particular gemstones associated with the month of birth, signs of our zodiac have also long been linked to semi precious gemstones. Each sign, as well as some birth months, have several associated gemstones, rather than being specific to a particular month or zodiac sign. 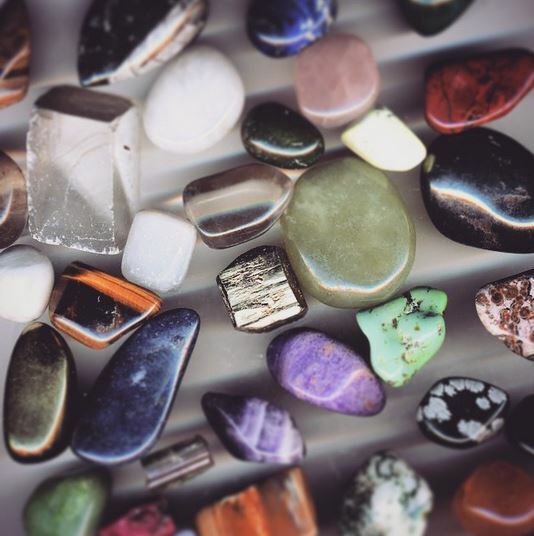 Anyolite, Aquamarine, Aventurine, Bloodstone, Cat's Eye, Citrine, Clear Quartz, Diamond, Emerald, Garnet, Hematite, Jade, Jadeite, Kyanite, Magnesite, Magnetite, Ruby and Sardonyx. Carnelian, Cat's Eye, Chrysocolla, Chrysoprase, Clear Quartz, Copper, Coral, Diamond, Emerald, Iolite, Jade, Kyanite, Lapis Lazuli, Rhodonite, Rose Quartz, Rutile and Blue Tourmaline. Agate, Apatite, Aquamarine, Chrysocolla, Chrysoprase, Citrine, Clear Quartz, Dendritic Agate, Emerald, Howlite, Jade, Onyx, Pearl, Peridot, Rutile, Sandstone, Blue Sapphire, Green Sapphire and Serpentine. Calcite, Carnelian, Chalcedony, Clear Quartz, Moonstone, Opal, Pearl, Ruby and Silver. Amber, Aventurine, Bronzite, Carnelian, Chrysoberyl, Citrine, Clear Quartz, Diamond, Garnet, Gold, Jasper, Labradorite, Onyx, Peridot, Petrified Wood, Picture Jasper, Rhodochrosite, Ruby, Yellow Sapphire, Sardonyx, Sunstone, Tiger Iron and Topaz. 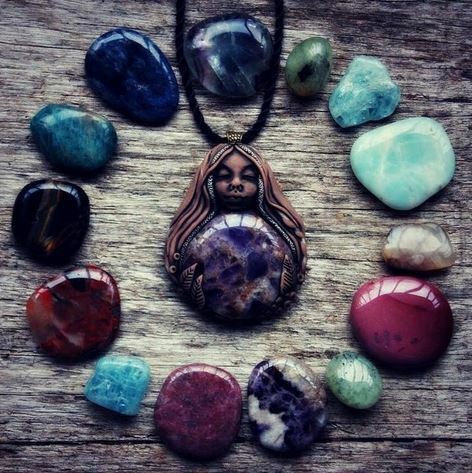 Agate, Almandine, Amazonite, Amethyst, Carnelian, Chalcedony, Chrysocolla, Clear Quartz, Dalmation Jasper, Garnet, Jasper, Magnetite, Moss Agate, Peridot, Sapphire, Snowflake Obsidian, Sugilite and Tourmaline. 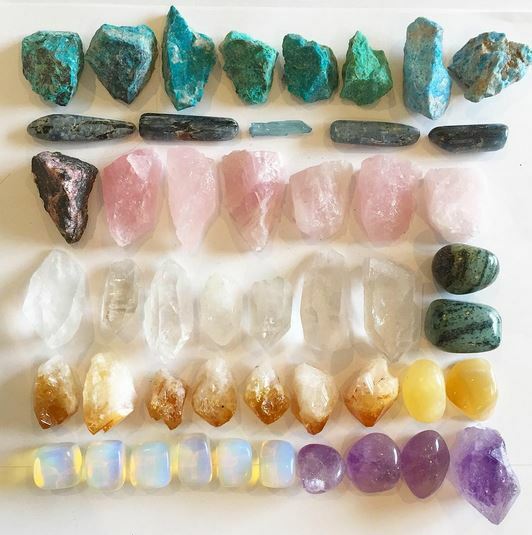 Ametrine, Bloodstone, Citrine, Clear Quartz, Emerald, Iolite, Jade, Kyanite, Lepidolite, Malachite, Moonstone, Nephrite Jade, Opal, Prehnite, Rose Quartz, Sapphire, Sunstone and Tourmaline. Almandine, Aquamarine, Botswana Agate, Boulder Opal, Charoite, Clear Quartz, Jasper, Labradorite, Malachite, Moonstone, Obsidian, Opal, Peridot, Rhodochrosite, Ruby, Smokey Quartz, Topaz, Turquoise and Unakite. 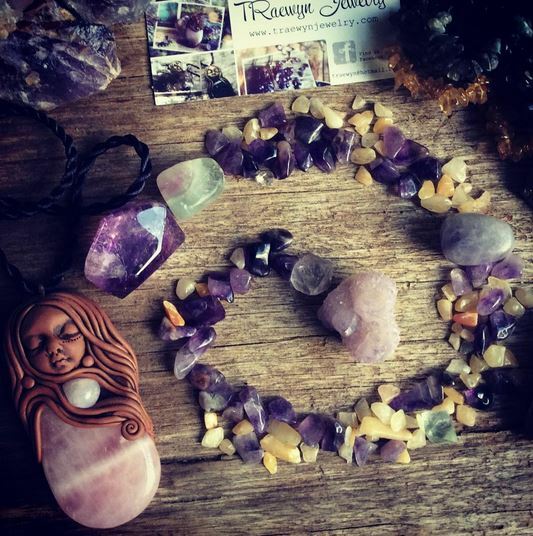 Amethyst, Chalcedony, Charoite, Clear Quartz, Copper, Iolite, Labradorite, Lapis Lazuli, Obsidian, Peridot, Ruby, Sapphire, Seraphinite, Smokey Quartz, Sodalite, Topaz, Turquoise and Vesuvianite. 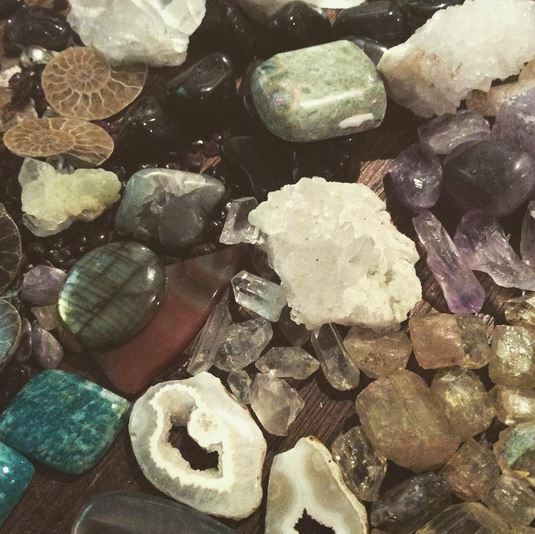 Amethyst, Aragonite, Cat's Eye, Clear Quartz, Fluorite, Magnetite, Malachite, Ocean Jasper, Smokey Quartz, Tiger Eye, Black Tourmaline, Green Tourmaline, Tourmaline Quartz and Vesuvianite. Amber, Amethyst, Angelite, Aquamarine, Chalcedony, Clear Quartz, Hematite, Larvikite, Magnetite, Silver and Turquoise. Amethyst, Aquamarine, Bloodstone, Blue Lace Agate, Clear Quartz, Coral, Fluorite, Opal, Shell and Turquoise. 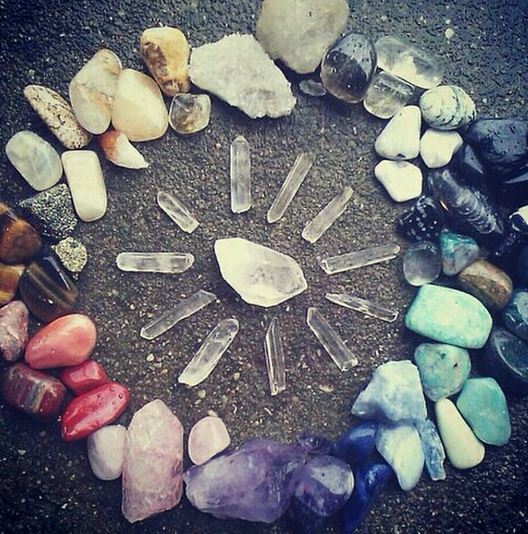 Crystal grids are made by the placement of stones in a geometric pattern for the specific purpose of directing energy toward a goal. 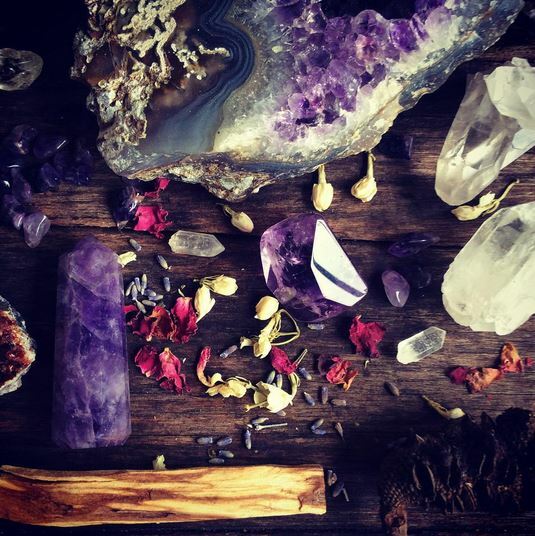 The stones or crystals are then charged by your intention and energy. Decide on your purpose for the grid. 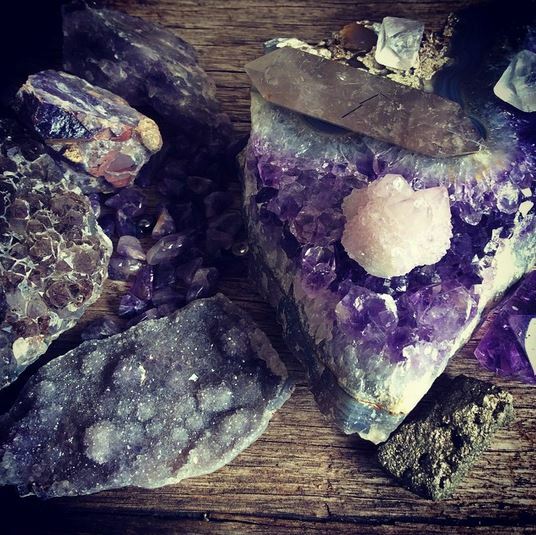 Your clear intention is a key element in empowering the stones' energy. 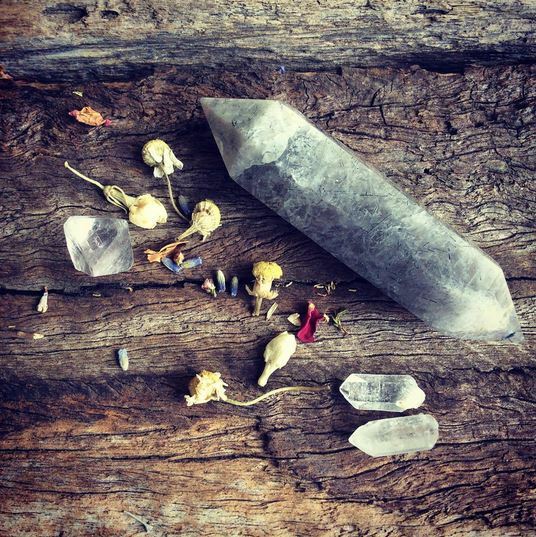 Your intention is what you will use to charge the crystals. Write your intention on a piece of paper (or on the back of a photo that depicts your goal). Find a safe location to create your grid where it will not be disturbed. Cleanse this space. 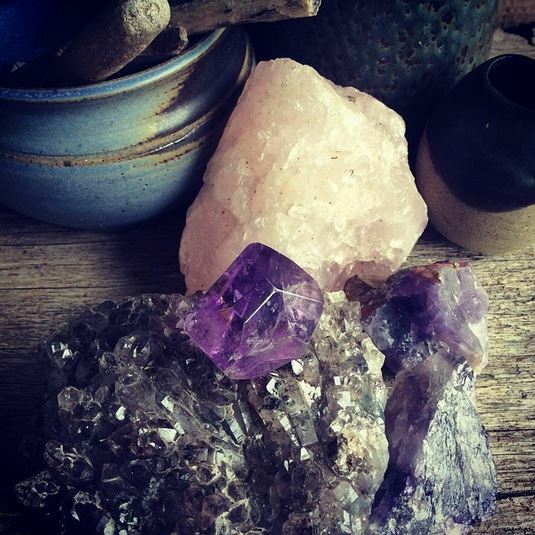 Some cleansing methods include burning sage, placing a crystal cluster in the room, or bowls of sea salt. Flowers, incense, music, candles can be used to add ambience to your sacred space. Relax and center yourself. Visualize your goal having already been achieved with a calm mind and positive intention. Say a prayer of gratitude. An important aspect of your grid is to have fun with it and be creative. You can't really make a mistake! The grids really do look beautiful as well. Perhaps you want to create a grid, simply because you think it looks pretty...go ahead! Anything that brings beauty to your world is a good thing! 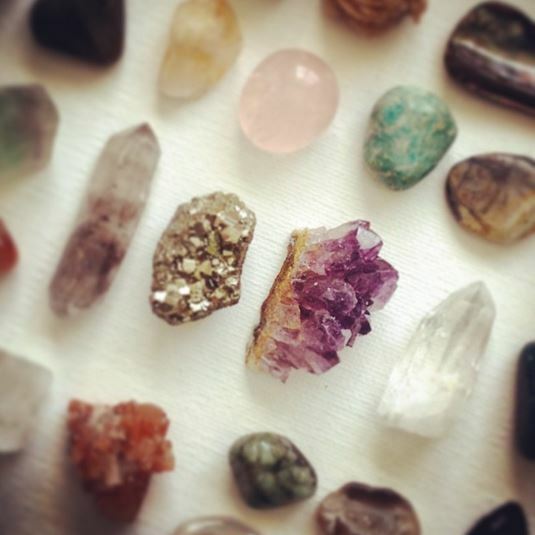 Many people associate various crystals and minerals with their healing colors. Eastern cultures associate colors to what they refer to as energy centers of the body, known as chakras. Each chakra has a primary associated color as well as secondary colors. 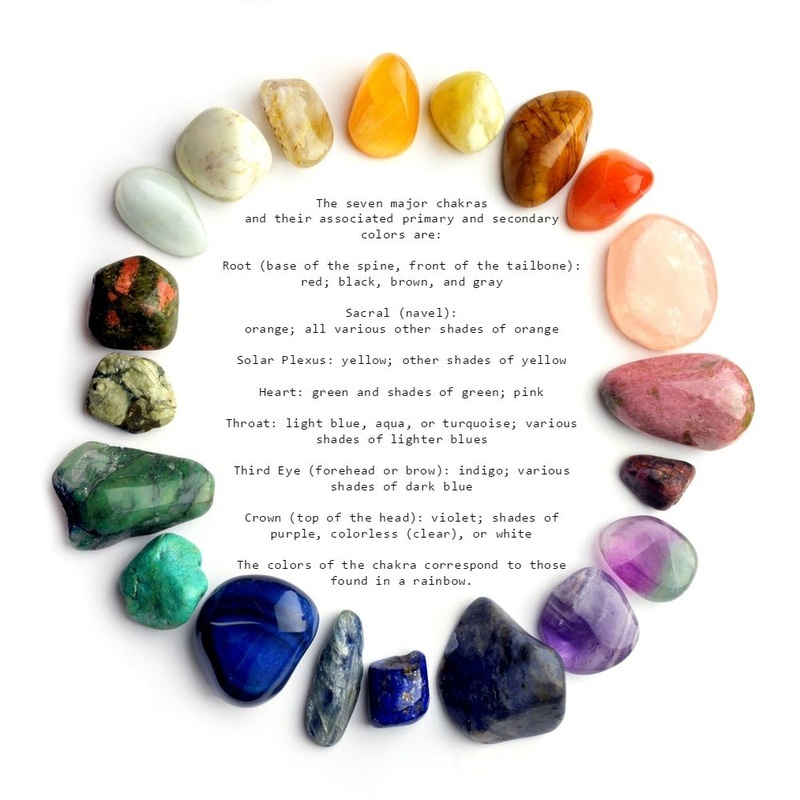 Once you know these color associations, you can provide benefits to specific areas of the body by associating each with the corresponding colors of the crystals or gemstones. Amazonite— Calms & Soothes; is good for those undergoing emotional processes; and pacifies worries, fear, and aggravations. It’s excellent for children, neurological problems, and nerves. Amber—Calms nerves, enlivens the body, and rekindles emotional & physical energy. 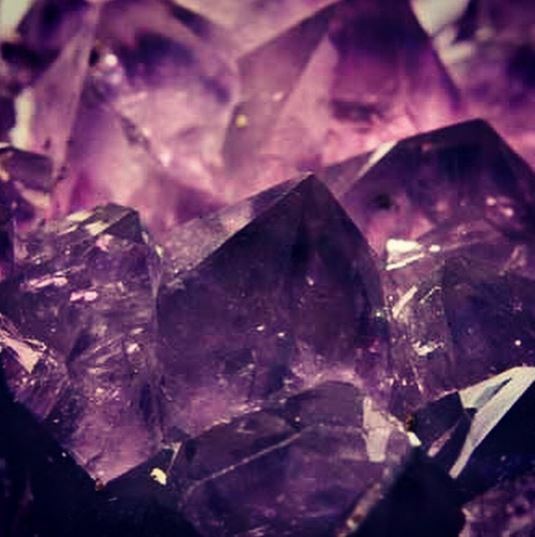 Amethyst—Releases any negative thought programming, clears emotional blockages, moves you into cooperation with other supportive forces, allows you to “sense” (use sensibility) with your emotions, and moves you into a more conscious state to see the cause and effect of your emotional responses. Apache tear—Good for moving through sorrow, grief, and forgiveness, it removes self-limitation and emotional barriers. 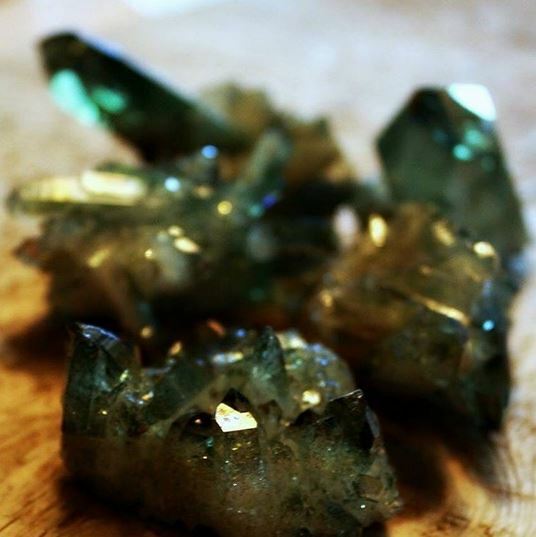 Aquamarine—Helps with fears, phobias, and anxiety; releases expectation; shields. Aventurine—Purifies the emotional body and tranquilizes nerves. 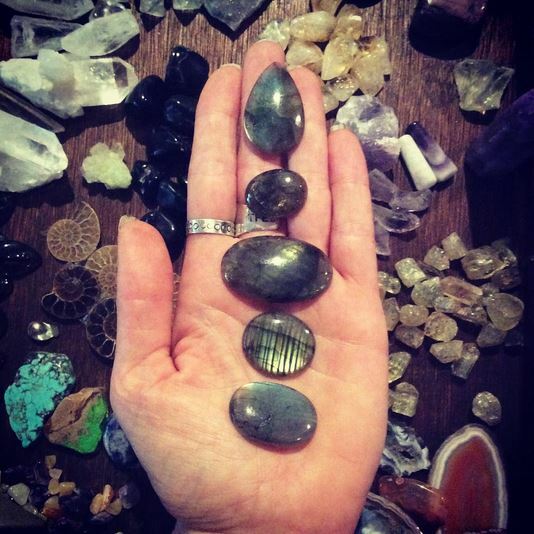 Bloodstone—Grounds the emotional heart, alleviates distress and anxiety, used as a support tool. Blue lace agate—Alleviates spiritual tension and emotional intensity. Botswana agate—Soothes repressed emotions and moves you beyond limits; it’s excellent for smokers whose nerves are on edge. Calcite (all colors)—Clears chakras by color. Calcite is a gentle cleanser of emotional upsets and helps you move forward after releasing emotional restrictions. Carnelian—Works with extreme negative states such as envy, fear, rage, and sorrow. 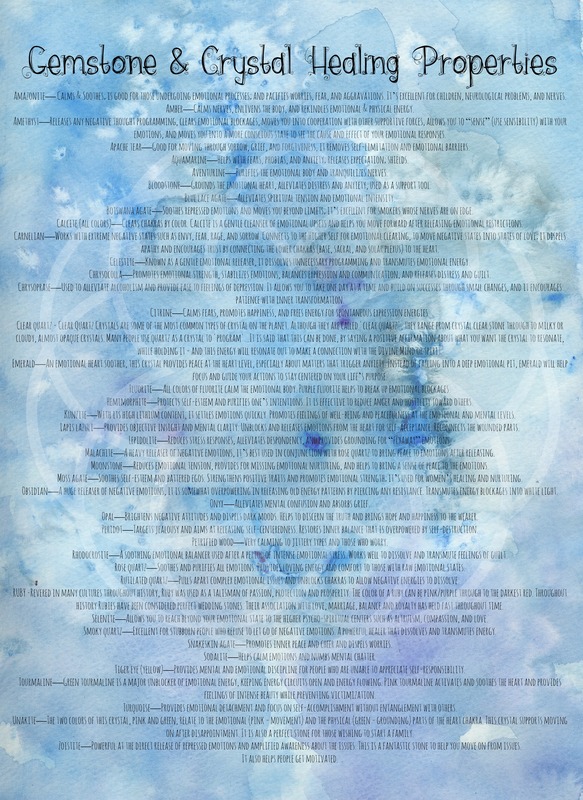 Connects to the Higher Self for emotional clearing, to move negative states into states of love; it dispels apathy and encourages trust by connecting the lower chakras (base, sacral, and solar plexus) to the heart. Celestite—Known as a gentle emotional releaser, it dissolves unnecessary programming and transmutes emotional energy. Chrysocolla—Promotes emotional strength, stabilizes emotions, balances expression and communication, and releases distress and guilt. Chrysoprase—Used to alleviate alcoholism and provide ease to feelings of depression. It allows you to take one day at a time and build on successes through small changes, and it encourages patience with inner transformation. Citrine—Calms fears, promotes happiness, and frees energy for spontaneous expression energies. Clear quartz - Clear Quartz Crystals are some of the most common types of crystal on the planet. Although they are called 'clear quartz', they range from crystal clear stone through to milky or cloudy, almost opaque crystals. 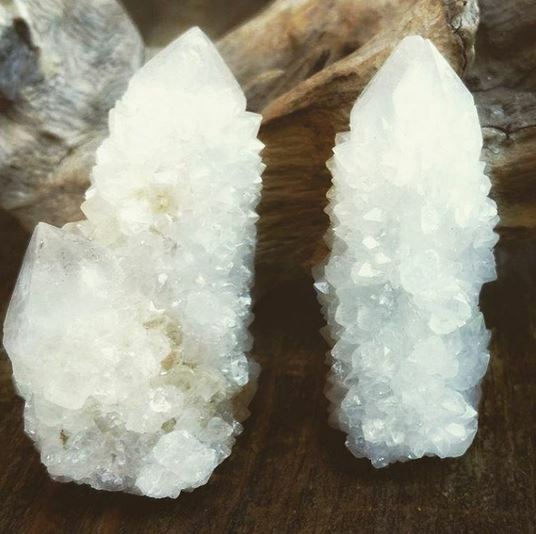 Many people use quartz as a crystal to 'program'...It is said that this can be done, by saying a positive affirmation about what you want the crystal to resonate, while holding it - and this energy will resonate out to make a connection with the Divine Mind or spirit. Emerald—An emotional heart soother, this crystal provides peace at the heart level, especially about matters that trigger anxiety. Instead of falling into a deep emotional pit, emerald will help focus and guide your actions to stay centered on your life’s purpose. 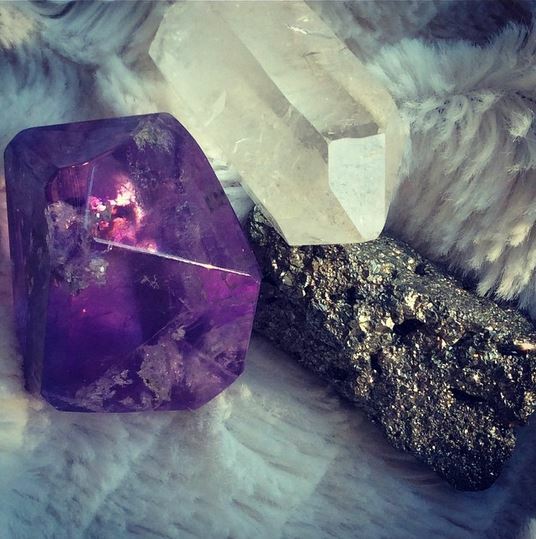 Fluorite—All colors of fluorite calm the emotional body. 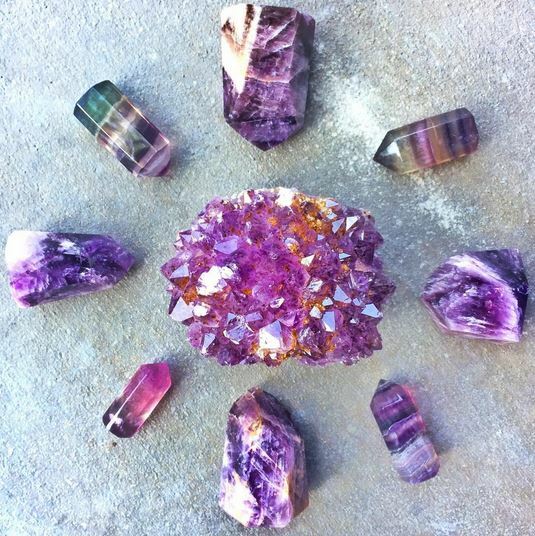 Purple fluorite helps to break up emotional blockages. Hemimorphite—Protects self-esteem and purifies one’s intentions. It is effective to reduce anger and hostility toward others. Jasper (All Types)- Jasper is known as the stone of gentleness, nurture, comfort, and relaxation. The Supreme nurturer. Jasper is used for bringing beauty into life and specific situations - inner and external. Jasper balances yin/yang energies. This is helpful in many areas of life and can bring healing, peace, and ease. Jasper is about nurture, peace and relaxation. It enhances one's ability to relax and come to peace even in difficult situations. This helps bring in wholeness, emotional healing, kindness, and comfort. Jasper also brings peace to endings, whether it be the end of a relationship, the end of a situation, or something else. It is a very good stone for healing grief, gently. 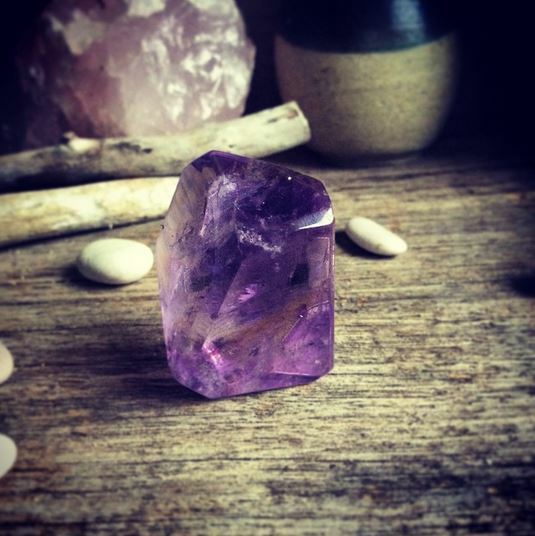 A wonderful stone for working with emotional disturbances, depression and trauma. It aids quick thinking, organisational abilities and helps overcome problems. Kunzite—With its high lithium content, it settles emotions quickly. Promotes feelings of well-being and peacefulness at the emotional and mental levels. Lapis lazuli—Provides objective insight and mental clarity. Unblocks and releases emotions from the heart for self-acceptance. Reconnects the wounded parts. 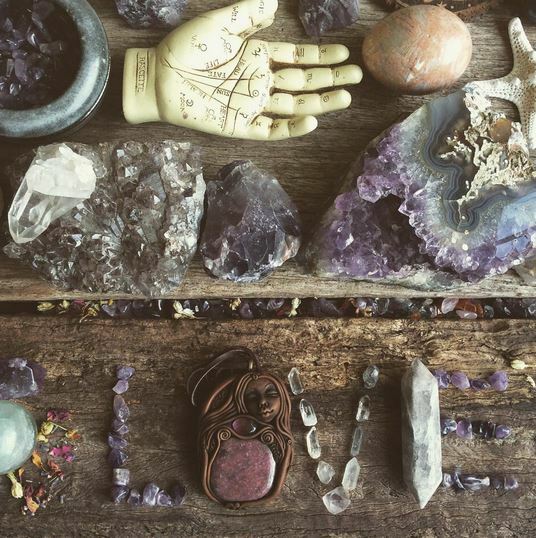 Lepidolite—Reduces stress responses, alleviates despondency, and provides grounding for “flyaway” emotions. Malachite—A heavy releaser of negative emotions, it’s best used in conjunction with rose quartz to bring peace to emotions after releasing. Moonstone—Reduces emotional tension, provides for missing emotional nurturing, and helps to bring a sense of peace to the emotions. Moss agate—Soothes self-esteem and battered egos. Strengthens positive traits and promotes emotional strength; it’s used for women’s healing and nurturing. Obsidian—A huge releaser of negative emotions, it is somewhat overpowering in releasing old energy patterns by piercing any resistance. Transmutes energy blockages into white light. Onyx—Alleviates mental confusion and absorbs grief. Opal—Brightens negative attitudes and dispels dark moods. Helps to discern the truth and brings hope and happiness to the wearer. Peridot—Targets jealousy and aims at releasing self-centeredness. Restores inner balance that is overpowered by self-destruction. Petrified wood—Very calming to jittery types and those who worry. Rhodocrosite—A soothing emotional balancer used after a period of intense emotional stress. Works well to dissolve and transmute feelings of guilt. Rose quartz—Soothes and purifies all emotions. Provides loving energy and comfort to those with raw emotional states. RUBY -Revered in many cultures throughout history, Ruby was used as a talisman of passion, protection and prosperity. The color of a ruby can be pink/purple through to the darkest red. Throughout history Rubies have been considered perfect wedding stones. Their association with love, marriage, balance and royalty has held fast throughout time. Selenite—Allows you to reach beyond your emotional state to the higher psycho-spiritual centers such as altruism, compassion, and love. 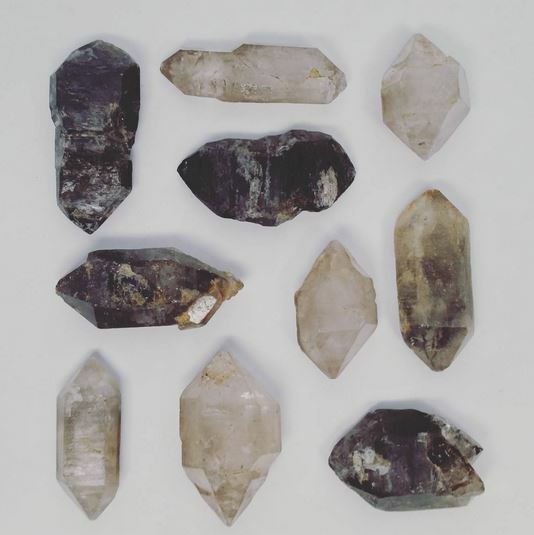 Smoky quartz—Excellent for stubborn people who refuse to let go of negative emotions. A powerful healer that dissolves and transmutes energy. Snakeskin agate—Promotes inner peace and cheer and dispels worries. Sodalite—Helps calm emotions and numbs mental chatter. Tiger eye (yellow)—Provides mental and emotional discipline for people who are unable to appreciate self-responsibility. Tourmaline—Green tourmaline is a major unblocker of emotional energy, keeping energy circuits open and energy flowing. Pink tourmaline activates and soothes the heart and provides feelings of intense beauty while preventing victimization. Turquoise—Provides emotional detachment and focus on self-accomplishment without entanglement with others. Unakite—The two colors of this crystal, pink and green, relate to the emotional (pink = movement) and the physical (green = grounding) parts of the heart chakra. This crystal supports moving on after disappointment. It is also a perfect stone for those wishing to start a family. Zoistite—Powerful at the direct release of repressed emotions and amplified awareness about the issues. This is a fantastic stone to help you move on from issues. It also helps people get motivated. ​watercolor poster - which you can download for free. ​ It prints out beautifully on A4 Photo Paper!